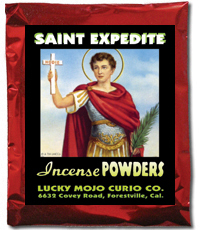 Just after Christmas, I petitioned to Saint Expedite to help me land a job in my industry. I was getting desperate and depressed. Within a few hours I got a job and had to pack my things and leave for the job the very next morning (I work on yachts). Unfortunately, I didn't get a chance to properly thank him. I publicly thanked him but didn't get a chance to offer him flowers or pound cake. I believe this came back to bite me because the trip I worked on took a toll on me physically and mentally. To make matters worse, I got deported back to my home country on our way back from the island. Luckily, I didn't get banned, but my visa was revoked and now I have to get a new one. I really want to go back because I have fallen in love with someone there and really miss him. He and I started a business together, so I really need to see him. I miss him dearly and cry every night over the situation and that we are away from each other. Lesson here: ALWAYS thank Saint Expedite! I should have known this since I've been working with him for 4 years now but I really learned my lesson. 1. How can I make amends with Saint Expedite? 2. Is there another saint I can petition to that will help me with my visa situation? Also one more suited for love? Thank you for sharing your story, and I'm very sorry all this happened to you. To make amends with St. Expedite, I wouldn't ask anything of him for a while. I'd give him a nice altar space, and spend a few months making weekly offerings and praying for his forgiveness. MissKing89, did you have vigil candles lit by MISC or did you just petition Saint Expedite on your own? Ladee, I petitioned him on my own! Thank you, Saint Expedite, for granting my petition. I have an open, 4-tier shelf in my living room that would make a beautiful space for Expedite. However, I currently have a space set aside for a small Guadalupe altar on the top tier. Will he be ok on the next shelf below Guadalupe, on his own shelf, or should I find him his own space all together? Or move her space? I don't want to be disrespectful and I'd like to enjoy his presence daily. It's a nice location to enjoy flowers and eat pound cake together. I would not move her space. Let him have his own space. He is a saint of the Catholic Church and there should be no conflict. In fact, his largest cite of veneration in the United States is in the Church of the Virgin of Guadelupe in New Orleans, where he has a niche. I petitioned to Saint Peter (for something unrelated) but either I petitioned him wrong or he didn't want to work with me. Could you suggest other saints that could help my visa situation? I was thinking Saint Jude (because my visa situation seems like a lost cause) and possibly trying Saint Expedite again as I've worked with Saint Expedite many times and now I know to properly thank him always. Thank you Saint Expedite for helping me get my visa! Please enjoy your pound cake! Lots of love! My lump sum finally funded, my work just started a new promo that is potentially huge revenue and love is going better moving along. You are all powerful and thank you again for all your help. As promised I have brought you rum flowers and pound cake for helping me again. Thank you! Thank you once again Saint Expedite for helping me out! I just landed my dream job and can't wait to move to the island!! I have a question about St Expedite. I have used him several times, but each time he only gives me a part of what I need. I ALWAYS pay him in full and on time. I know he only helps with what you NEED, and I never ask for a penny more (I literally write it out to insure that I never ask for anymore than what I absolutely need). Last time, I NEEDED $2000. He gave me $1150. The time before that, I needed $3000 and got $2500 (which was supposed to be $2600). My money situation is precarious right now (it was bad before but I woke up this morning to no power due to nonpayment; I had to put myself further into hock with someone I already owe money to in order to get it back on) and I need help again, but I am scared to ask him. I don't know any other Saint to ask for help and he's the most appropriate one as far as I know. Wow, well that is better than nothing at all! Please don't take offense but I ask that people NOT say that they have "used" a Saint. It makes me nervous that the Saint will see it and get upset. I'm so sorry, Miss Aida. I didn't mean any offense. I have much respect for St Expedite; he's the only Saint in my home (I have a small statue of him as well as a card). And now I know better so I won't make the same mistake again. Please don't get me wrong, I am not complaining at all and I am grateful. I'm just confuzzled (confused+puzzled) as to why it happens. Oh my, St. Expedite, I can't believe how much you came through for me in what I thought was an impossible situation. It was miraculous. I just made a donation in your honor to the pro bono rootworkers fund. I would like to know how to petition saint expedite. Like do you say it to him verbally during one of the listed prayers or do I write it down on Brown paper and place it where?? I have looked on the page for saint expedite but doesn't say anything other than how to set up altar and prayers. The petition paper ad the verbal prayer. Thank you Saint Expedite for so quickly answering my petition. Thank You Saint Expedite For Your Help Your Loyal And Quick I am Honored Too Have You As A Saint In My Home Love You Much And Look Forward Too Working With You Again And Thank You Again For Helping Someone Else That I Asked You Too Help Amen. All blessings to St. Expedite! I was very nervous about taking some exams for a few college courses and did not study like I should have. I prayed to St. Expedite, offered water, prayed for assistance and lit a red candle. 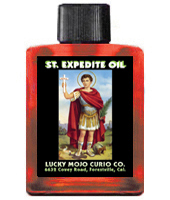 I have passed all of my exams thanks to St. Expedite! Working with him has been so wonderful. I have given him a piece of pound cake and am singing his praises! Thanks again St. Expedite! When is his day of prayer? I would like to pray to him along side st martha to get my boyfriend to move in with me. St martha is doing a wonderful job of getting him to want to, I just need St Expidite to get him to move in faster. I guess you could say My boyfriend is procrastinating on the act of doing it, so he needs a push. I Thank Saint Expedite So Much For How He Helps Me Is A Very Loyal Saint And Honorable He Does Come Threw Fast And I Appreciate You So Much Saint Expedite For Truly It Was Hodie And Not Cras Thank You Saint Expedite For All You Do And Will Continue Too Do For Me And My Family. Help required... I was involved in a car accident last year, I was to receive insurance claim from both car owners (I was a passenger). The claim came to £10,000, due to the case dragging, I petitioned to Saint Expedite. However, what I received was a form from the law firm representing me to fill out another form. I did and posted it early last month. At the time, My petition was to win the court case and claim, however, what I received was a form. I just felt Saint Expedite didn't answer my petition like he did in the past. Now, I've just received a letter from my lawyers saying they never received the form I posted to them and they don't believe I'll be able to make that much of claim anymore. Secondly, I'm currently staying with a friend and it's just come to my attention by the council, that he hasn't been paying the tax, making me liable to pay £500 within 2wks. I'm confused... the form I received from the lawyers initially was I supposed to thank Saint Expedite even though it wasn't what I petitioned for? If I was, is there a way to appease him (Saint Expedite) once again? CONFUSED!!! Thanks for the recommendation. The form was to fill out my expenses claim; such as chiropractor fees, medical expenses etc. Like you suggested, I'll perform another petition with offerings. St. Expedite, you are indeed miraculous. I said your 9 hour novena today and within 2 hours - I saw movement and by the 6th hour- a breakthrough. I have no words that can express my gratitude. You are amazing and thank you thank you thank you. Happy Feast Day!!!!! Thank you St. Expedite! You came through and helped me, along with my work and prayers. Enjoy the lovely flowers and pound cake! You really are amazing. I did a nine hour novena and got a sign while the candle was still burning within two hours and the wish was granted the next day. But please prepare your offerings beforehand and be ready to offer them as soon as possible. Thank you again St.Expedite. Forgive me if I did anything wrong. After reading Mitch Horowitz' story around St. Expedite, I began on an appropriate Wed. with an image, a red candle, a glass of water, a written petition and a prayer. Then candle burned for 4 days and I burnt the petition in the flame. I then continued the prayer for another 4 weeks. I had asked for a certain amount of money by a certain date - today. In return I promised a red flower, a bag of red spices, another candle & to glorify his name on the net with testimony. So here I am - magnifying the name of Expedite! At this moment I am making the offering even tho' the money hasn't arrived - but you know, it's a holiday today. So I'm keeping faith with my promises to him on this date. Glory to St. Expedite & may all who call on him receive his aid. Let me note that during this period I've had intense dreams and unusual occurrences. Just today a tarot deck tucked safely on its shelf lept to the floor spilling its cards all over. I'm taking this as a message from Expedite! Will update. Thank you Blessed saint! You would have to get a reading on this to find the answers. Thank you again Saint Expedite!!! Thank you, St. Expedite, for granting my petition! Do i pray to st expidite every wednesday for 9 wednesday or everyday starting wednesday for 9 days straight? I know for a fact that what im asking for will not happen in 9 days, but 9 wednesdays from now it is very possible. Will he be upset if i only pray on wednesdays? I also cannot leave a candle burning when Im not home, so I have to let the flame out whenever i leave for work. So praying every wednesday evening and putting the candle out thursday morning works best for me. Will he be understanding of this? Thanks! It really ought to be done for 9 consecutive days. Thanks for the response! I wrote a deadline on my petition, so I will pray for 9 days straight and then wait for the deadline to come? Then if he answers my prayer by the deadline I give him the offerings? Thanks! Just want to make sure I do this right. Also, i got a sign that he will work with me early thursday morning. So Im hopeful! Hello everyone I'm new here, if I'm breaking any rules I'm so sorry . I just want to share my story. I petition Saint Expedite along with Saint Jude about a week ago. My ex and I broke up and he was trying to get with his coworker a few days after and they were going to go out on a date the following weekend, when I learned about this news I was devastated because I still love him very much. I went out and bought a yellow candle and printed out a picture of St Expedite. I offered him water and lemon cake. I cried my eyes out and prayed to him, explaining my situation and how I don't want that date to happen. On the day that they're supposed to have the date my friend (who is a mutual of his) told me that she canceled the date on him because she wasn't having a good day. I was of course so happy to hear that news until my friend told me an additinal detail, she told him instead to go out for a drink with her later on that night (which my ex told my friend it' only going to be the two of them). I realized then that St Expedite followed up exactly to a tea in my request, that date was cancelled but they made another one. So I sat down and prayed to him again. I told him that I did not want them to be going out at all with each other because it hurts me, I didn't want them to go out drinking together alone and if they do end up going I wish they will lose interest in each other. I told him I'm hurt and didn't want them to end up with each other at all and want him to have a bad night. The next morning when I talked to my friend, she told me that my ex went out drinking with the girl but she brought some of her friends, drank with him for 30 minutes and left with her crowd leaving him at the bar drinking a lone. He went home and told her that he missed me and that he doesn't know why he always pick the wrong choices. He said the other girl was cool but he doesn't have an interest in her anymore. I'm amazed at Saint Expedite's influence and how fast he works. He is truly amazing and I am so grateful that he would come through for me since it's my first time petitioning him. Thank you St Expedite for everything you have done. My ex and I broke up a few weeks ago because I found out about his infidelity. I started praying the novena six days ago. Today I lit a red candle being that it's Wednesday but it left a little wax in the bottom of the candle holder. However when I went to the doctors office I saw his first name on the sign in sheet. The persons name was "Michael conception" then I heard the receptionist say "here is Michael". Should that be taken as a sign? And should I light a yellow candle to St. expedite (tomorrow) is Tuesday, seeing as the other candle left a little wax today? Sorry we missed this question! It could be a sign, but I can't be sure without giving you a reading. Michael is a pretty common name after all. I think you should just continue with your work and see if you get any signs once it's completed. I'm not sure why you would switch to a yellow candle (red is very traditional for St. Expedite, so if you have more red, just stick with that). If you are out of red candles though and need to switch to yellow, I'm sure he'll understand. And if you've been lighting a candle every day through this novena, I'd recommend just sticking to that pattern whether the red candle left wax behind or not. Thank you St. Expedite for helping me again! How are you doing?? How are you feeling? I hope you're doing ell. Thank you again St. Expedite! You always come through for me!! I wanted to ask a question about Saint Expedite. I had the Saint Expedite candle and it just finished burning the other day so if I continue to speak to my little Saint Expedite figurine and I still use the Saint Expedite oil with its sachet powder and I still buy it flowers and cake will it still work for me? And give it a little bit of time.